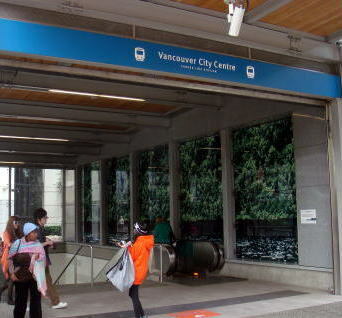 opened in 2009 in advance of the 2010 Winter Olympics. 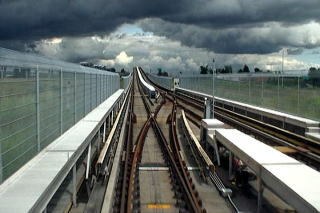 from the other two SkyTrain lines. 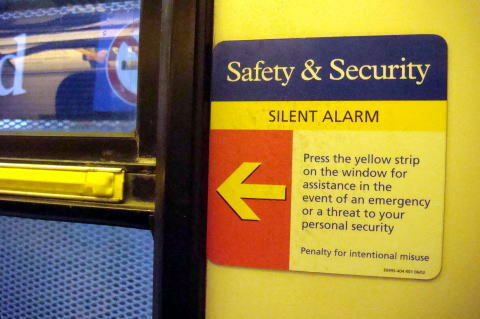 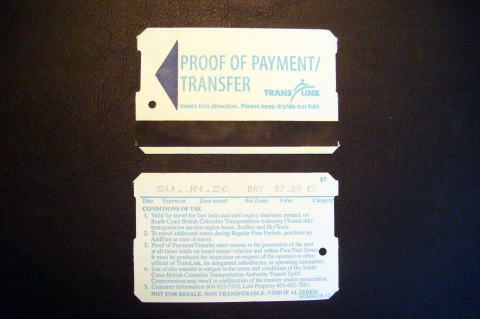 (L) A proof-of-payment document (R) A silent yellow-strip alarm in case when needed a police service. 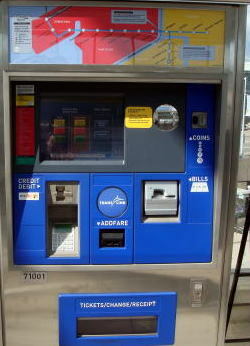 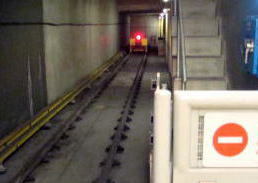 the trains manually if necessary. 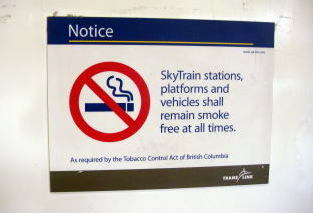 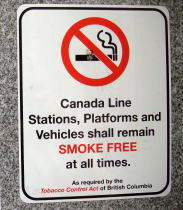 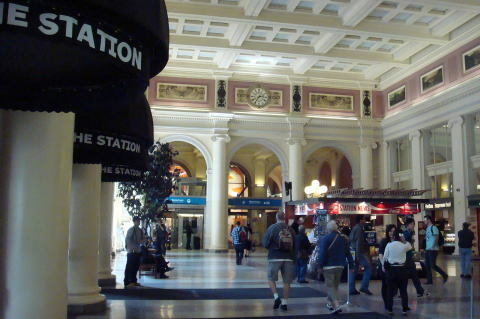 (L) Waterfront station and track lines of the West Coast Express (R) No-smoking sign posted on the plateform of Canada Line. 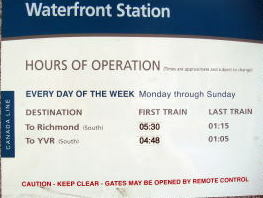 There is no train service between 1:05 and 4:48 AM. 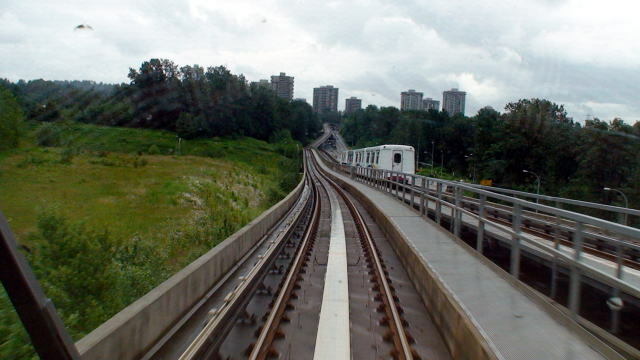 (M) The railway track of Canada Line goes up to the surface after Langara-49th Avenue Station. 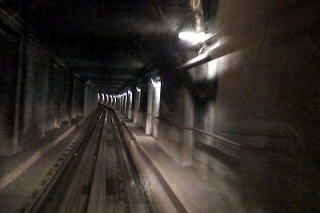 The underground railway is constructed as a cut-and-cover tunnel. 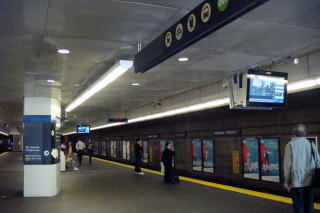 (R) Columbia Station of the Expo Line in New Westminister is mainly in the underground. 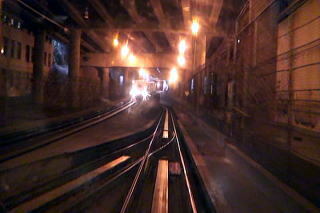 The line branches off here to King George and VCC-Clark. 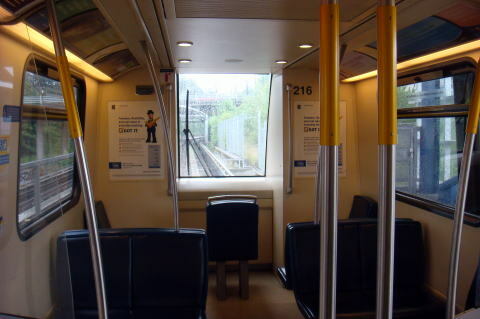 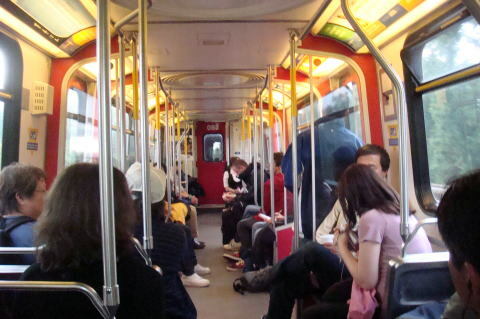 Photographs show the inside scene of SkyTrain and the drivers-eye front-row sheet. 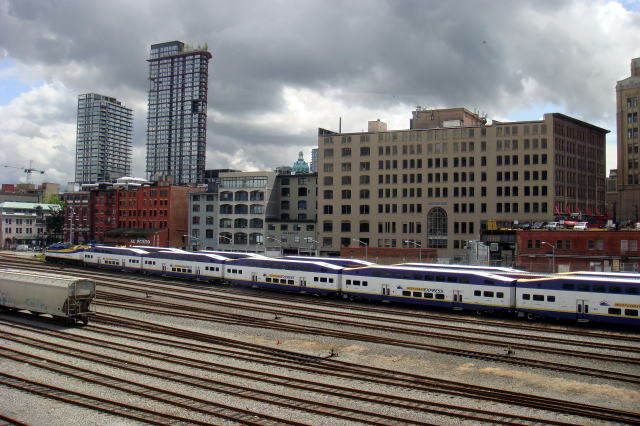 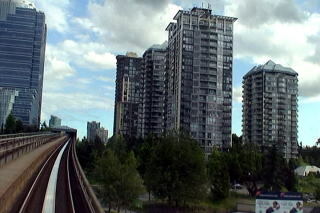 (L) Condominium buildings located between Stadium-Chinatown and Main Street-Science World stations. 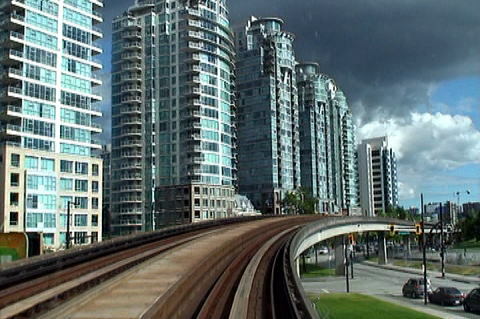 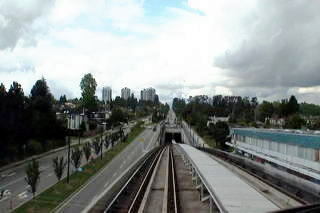 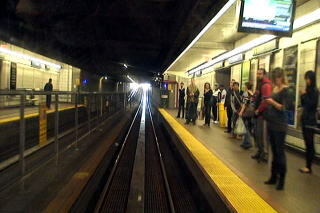 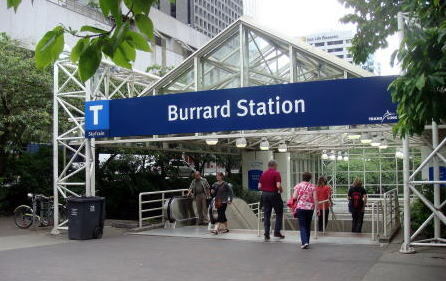 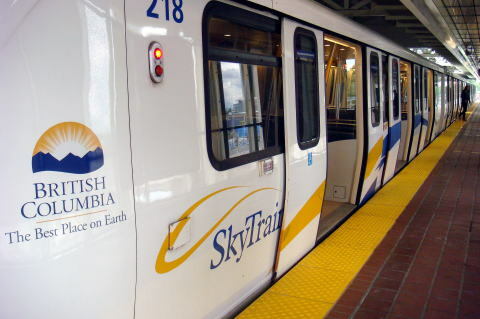 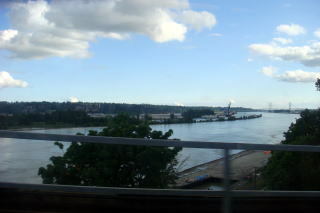 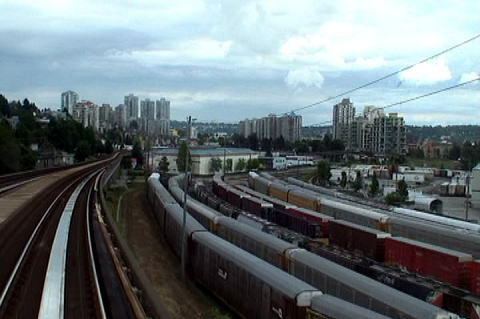 (R) Skytrain track line often runs in parallel to the Canadian National Railway, the Canada's largest freight railroad. 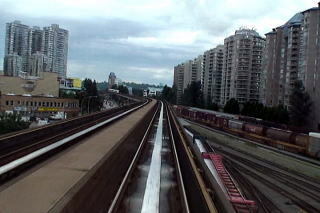 New Westminister station is ahead, and Freser River in the right. 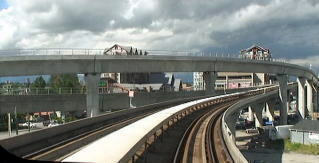 Millennium Line and Expo Line are important public transportation to the Metropolitan residents. 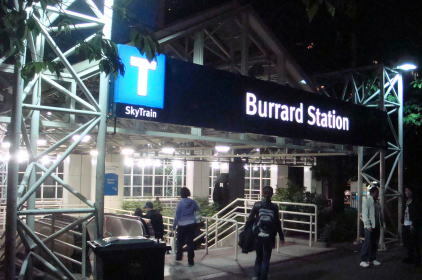 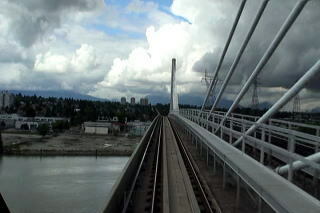 Skytrain Bridge has two tracks of Sky-Train, which is exclusively for Vancouver Sky-Train. 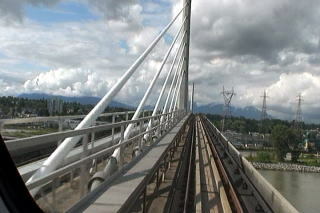 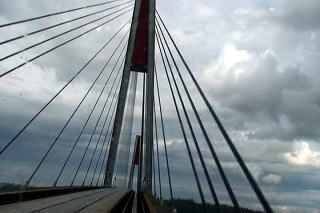 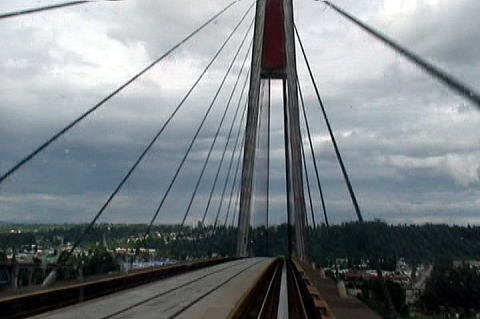 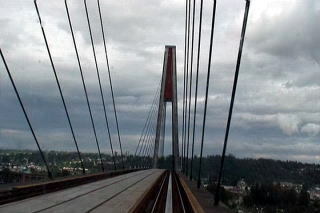 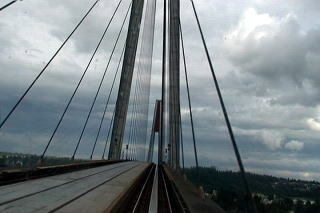 (L) Two tracks of Sky-Train at cable-stayed bridge, Skytrain Bridge. 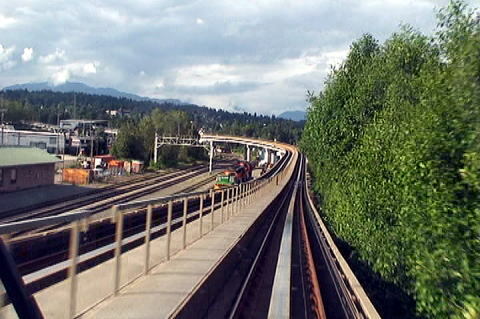 (R) A Sky-Train track line runs in parallel to the VIA railroad in suburban Vancouver. 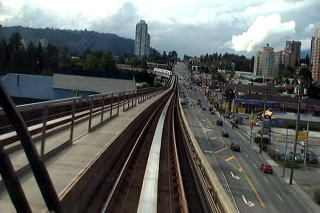 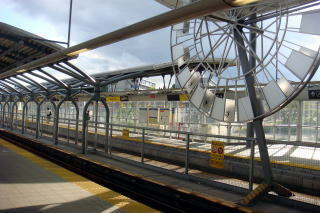 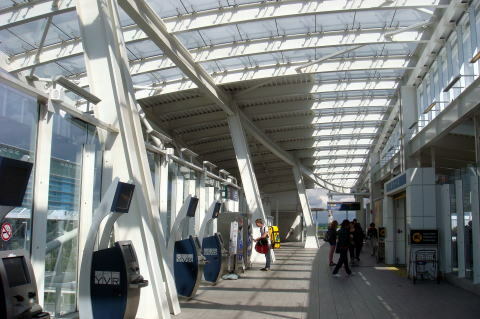 (R) The railway track runs in parallel to the Trans-Canada-Highway, and then crosses the road, arriving at the Lougheed Town Centre Station. 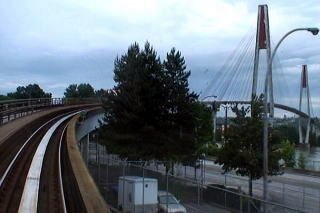 and links Oak Street Bridge, South Vancouver to Bridgeport, Richmond. 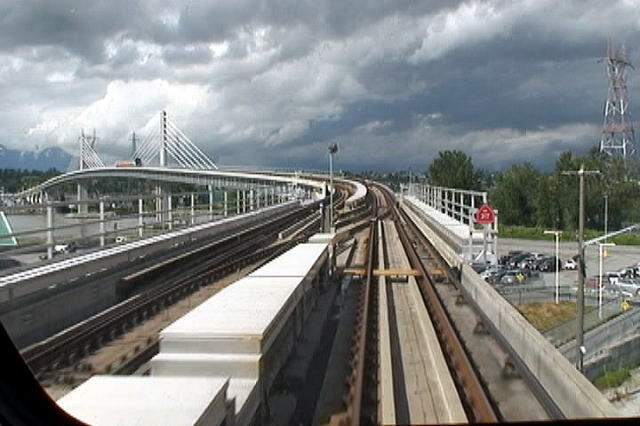 The pictures show the North Arm Bridge and track lines near the Bridgeport station, Richmond. 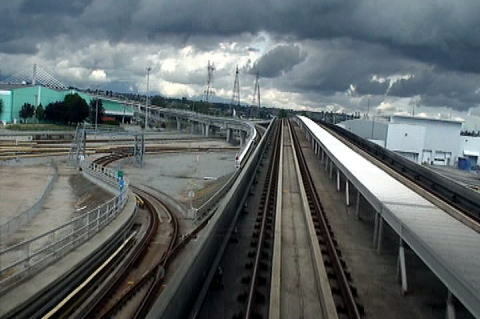 Canada Line railway track, photographed near the Vancouver International Airport. 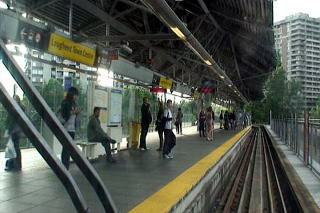 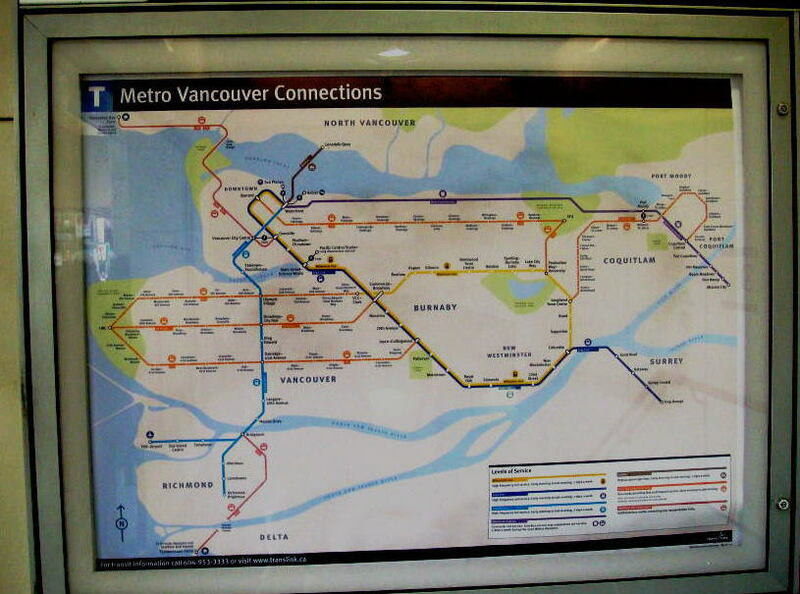 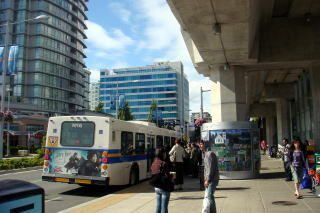 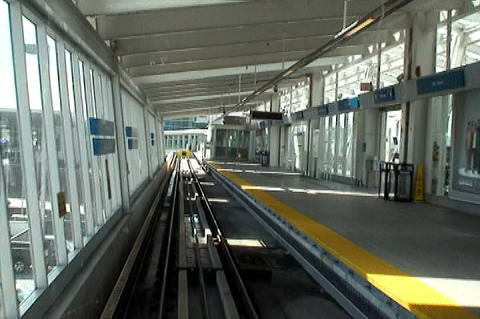 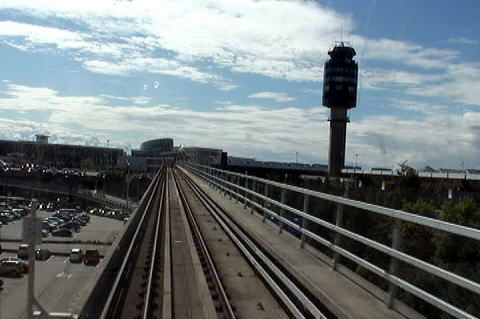 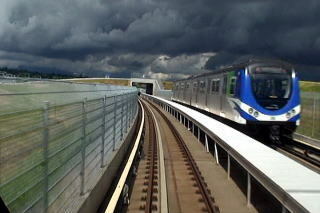 (L) The junction of Canada Line, which is divided to the Airport and Richmond-Brighouse. 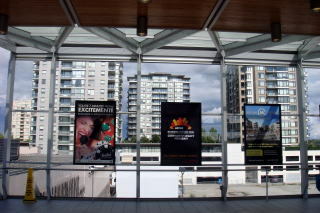 All photographs were taken in June 2011. 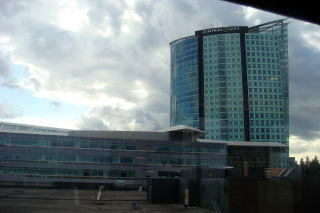 The article was written in July 2011, by Junhaku Miyamoto, M.D., PhD.